From enchanting shops and magnificent estates to gingerbread manors and mountain retreats, Lemax Collectibles offers a world of magical miniatures complete with figurines, accessories and landscaping. Founded in1990, The Lemax Company entered the world of miniatures with a small collection of lighted houses. Through the years, they grew to be a leader in miniature collectible villages offering more than 2,000 pieces in their product line. 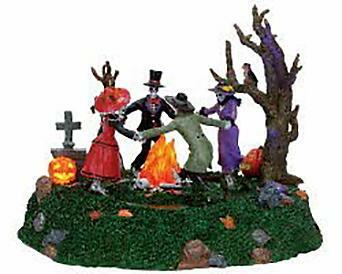 Lemax miniatures provide a unique alternative to antique Victorian Christmas houses and elaborate holiday putzes. 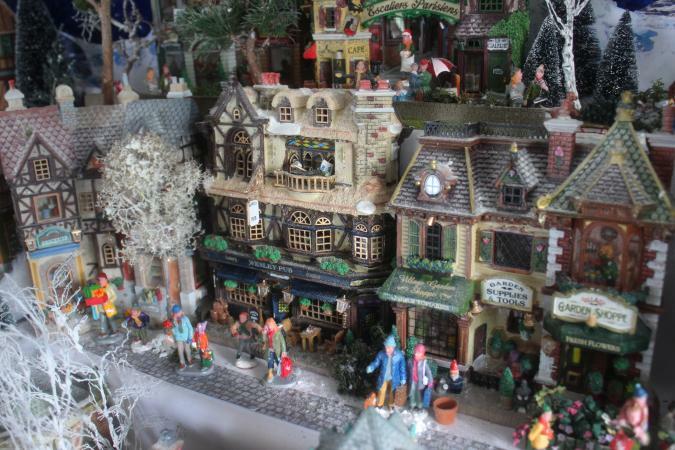 Lemax Christmas village miniatures, along with miniatures of their other holiday themes, are sought after by serious collectors as well as casual decorators. The magnificent fine details combined with the affordable pricing, make collectibles desirable to beginning collectors and those that are more experienced. Each of the miniature collections includes an assortment of buildings, houses and figurines that make up an entire cozy village of Lemax Collectibles. Many of these beautiful pieces feature lights, animated areas and lifelike three-dimensional scenes visible through display windows. Of special interest to collectors are retired pieces and limited editions that become available once a year. A favorite theme of collectors worldwide, the Caddington Village collection is a charming assortment of Lemax Collectibles featuring life in the late 1890's. Horse drawn carriage drivers, Victorian Christmas carolers and children playing on a see saw are a few of the turn of the century figurines adding a sense of joy and happiness to picturesque Victorian scenes. Exquisite cathedrals, quaint shops and beautiful homes are part of this popular collection. There are more than 100 retired pieces in the Caddington Village Collection including favorites such as Bed and Breakfast, the Powell Street Fire Station and Fuzzy Friends Pet Palace. This quaint seaside village called Plymouth Corners is a New England fishing town. The people are friendly as they share ice cream at Pearl's Ice Cream Parlor or enjoy a relaxing dinner at the Rusty Pelican Restaurant and Market. Along with the many nautically inspired buildings, this collection features highly detailed ships and lighthouses. The pieces in this spectacular collection are authentic replicas from the latter half of the 1800s and the early 1900s. Anyone that loves the sea or collects lighthouses will fall in love with this exquisite collection. Beautiful autumn scenery surrounds the farming community of Harvest Crossing. As farmers harvest the hay and children take their prized pigs to the county fair. This collection has plenty of country flair with tractors, hayrides and animals. Buildings include country favorites such as the Harrison Company Flea Market, Phil's Dinner and the Tucker Farm House. Ghosts, goblins and haunted houses make the Spooky Town Collection a Halloween treat. The Dead as a Doornail Morgue, Pirates Grub and Pub and assorted scary buildings are a perfect backdrop for the vast array of spooky collectibles. Line the streets with Skull Street Lamps as costumed figurines go trick or treating. This is a perfect collection for anyone that loves Halloween. The Vail Village Collection represents life in a modern, trendy vacation ski area. There are ski chalets nestled in snow-capped mountains, health spas and restaurants. From the Wildwood Theater to the Block and Cleaver Butcher Shop, each piece of this wonderful collection represents an upbeat resort community. 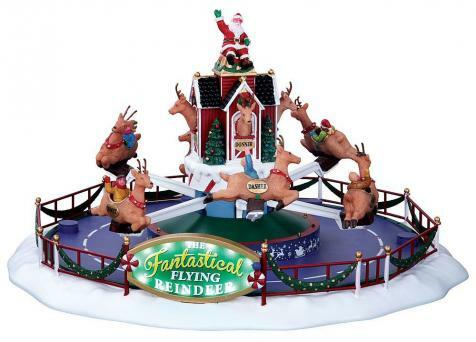 Figurines include happy skiers, sleigh riders and children making snow angels. There are bears, wolves and other wildlife creatures to add to your village scene. Santa and his elves are busy making toys in the bustling community of Santa's Wonderland. Capture the fun of Christmas with these vibrantly colored miniatures featuring Santa Claus Manor, Northern Delights Bakery and the Elf Diner. Watch the children swing on Santa's Swing as Santa and his friends the penguins and polar bear toast marshmallows around a campfire. This Lemax Collection includes many humorous and fun pieces. The steam-powered calliope plays inviting music as fairgoers enter the Carnival grounds. Children ride the Tea Cups, visit the Petting Zoo and enjoy riding an elephant at the Safari Rides. The Carnival Collection includes all the classic rides such as the Belmont Carousel, The Starburst and Crazy Cars. Clowns and jugglers join happy carnival goers at these colorful fairgrounds. The Sugar N' Spice Collection features fantasy buildings made of cookies, cakes and candies. Each porcelain confectionary delight looks good enough to eat. Buildings include the Jelly Bean Post Office, the Cocoa Cup Café and the Gingerbread Cottage. Most of the figurines are gingerbread people including a Gingerbread Wedding Party, children at a bus stop and gingerbread carolers. Most of the pieces in the Lemax collectibles collections can easily be incorporated into one another making the possibility of village designs endless. Lemax collectibles offers a vast array of products to fit the style and budget of collectors everywhere. 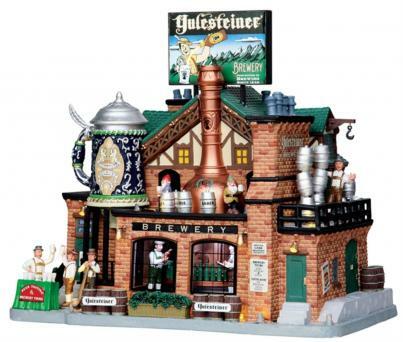 Enjoy the hobby of collecting and displaying Lemax lighted miniature villages. Your collection is sure to bring smiles to the faces of family and friends for years to come.